The oddsmakers said the Indianapolis Colts were about 5 1/2 point favorites against the New Orleans Saints in Sunday’s Super Bowl game at Sun Life Stadium. With these two teams, offense is the modus operandi and defense is sometimes an afterthought. Early on, it looked like the Colts would settle the matter early as they scored 10 quick points in the first quarter. But the Saints would come to life as they scored 18 unanswered points, capped by a Tracy Porter pick-6, elevating New Orleans to their first Super Bowl victory, 31-17, over Indianapolis. Peyton Manning looked impressive on the Colts’ first two drives, taking his team 53 yards to a 38-yard Matt Stover field goal; Manning then led a 11-play, 96-yard drive – tied for the longest series drive in Super Bowl history – which was capped by a 19-yard touchdown pass from Manning to Pierre Garcon, putting the Colts up 10-0. The Saints did get on the scoreboard on a 46-yard Garrett Hartley field goal, making it 10-3; the Colts defense, which was ranked 18th during the regular season, manned up as they clamped the Saints down on a fourth-and-goal. Curiously, the Colts, instead of te usual pass-on-first down routine, opted for running the ball three consecutive times, leaving New Orleans 35 seconds to add another Hartley field goal, sending both teams to their respective locker rooms with the Colts ahead 10-6. Interestingly, the Saints opted for an onside kick, which would be successful; they would like the Saints of the regular season as a Drew Brees 16-yard screen pass to Pierre Thomas would hit paydirt, giving New Orleans their first lead of the game at 13-10. But Manning would shrug it off, leading the Colts on their next possession on a 76-yard drive, capped by a Joseph Addai 4-yard run, allowing the Colts to regain the lead at 17-13; That would be it for the rest of the night for the Colts. After a 47-yard FG by Hartley with 2:01 left in the third period put the Saints to within 17-16, Brees would connect with Jeremy Shockey on a 2-yard TD pass, giving New Orleans a 24-17 lead. The issue was settled when Manning threw an interception whcih was picked off by Tracy Porter; Porter would return the pick 74 yards for the score, putting the Saints ahead for good. Brees went 32-of-39 for 288 yards with 2 TDs while Manning had a decent game by most other NFL quarterbacks’ standards, going 31-of-45 for 333 yards with a TD and an INT. Thomas led all Saints rushers with 9 carries for 30 yards while catching 6 passes for 55 yards and a TD; Addai led the Colts rushing attack with 77 yards on 13 carries and a score while catching 7 passes for 58 yards. Marques Colston led the Saints receivers with 7 receptions for 83 yards while Devery Henderson caught 7 for 63 yards; Dallas Clark led all Colts receivers with 7 catches for 86 yards while Austin Collie and Pierre Garcon caught 6 and 5 passes respectively for 66 yards with Garcon scoring a TD. With the victory, the New Orleans Saints won their first Super Bowl in the franchise’s 34-year history. 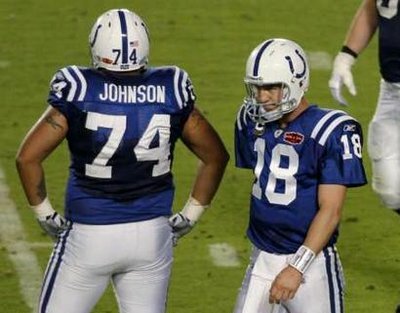 The Colts, while making the game competitive, will go into the offseason mulling any moves that will be necessary for them to return to the Super Bowl in February 2011. I think we should not consider keeping Mr. Hank Baskett next season considering he is a wide reciever (supposed to have good hands) but failed to even put a hand on the onside kick that bounced off his helmet??? Geesh. It was the missed FG from Stover that changed the game & Manning was pissed at that miss.